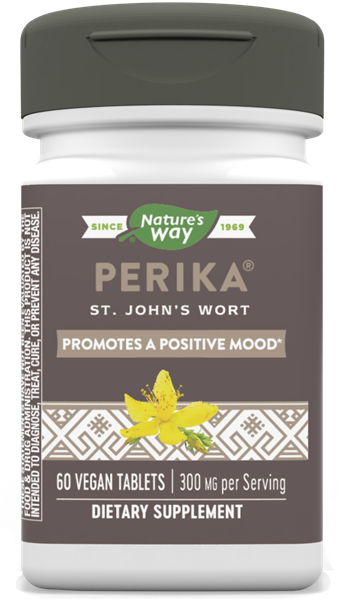 Perika (St. John’s Wort) / 60 Tabs - Nature's Way®. Hyperforin is rather unstable and can lose potency over time. However, using our proprietary HyperiSure System stabilizing technology, Perika delivers a guaranteed level of hyperforin for optimal potency. Take 1 tablet with water 3 times daily at mealtimes. Best results occur after 2-4 weeks of regular use. CAUTION: This product should not be used by pregnant or nursing women or by persons who are taking antidepressant medications. Persons taking other prescription drugs should seek the advice of prescribing physician prior to using this product. Avoid excessive exposure to UV radiation (e.g., sunlight, tanning) when taking this product.